Last week, a friend shared this idea that he had heard from a colleague earlier that week, and it felt to me to describe my state of being that week. I went home ready to write a self-satisfied blog post about how I had finally learned the art of effective paddling, so as to be doing a lot of work beneath the surface while maintaining an outward calm. Last week, the 'to-do' lists effectively guided me through the myriad tasks. Last week, I started most days with tai chi; walked most afternoons. Last week, I was in a zone, in the flow, keeping all the balls I juggle in the air ... last week. This morning at the petrol station, as I was filling up my car, the attendant came out and spoke to another customer, who was filling cans in a trailer. Apparently you're not supposed to leave them in a trailer, but instead take the cans out to fill them. The customer was not impressed, arguing some credentials in the area of workplace safety, but as the attendant insisted, he acquiesced. Then loudly, once the attendant had returned inside, and this customer took cans off the trailer and filled them, he yelled back towards the shop, aggressively. A friend of this customer happened to be there, and they got talking. As I returned to my car, I threw over one line - 'she's just doing her job', was told I hadn't been invited into the conversation, replied, 'fair enough', and went on my way. I have been pondering in recent weeks, the implications of the special days we celebrate in our society. In Australia, one of the biggest national holidays is ANZAC day (for those further afield, Australia & New Zealand Army Corps; 25 April marks the day a very large contingent of this Corps fell victim to a rather significant error in judgement on the part of the British army, under whom our nations fought, on a beach in Turkey). I often feel conflicted on ANZAC day, and this year, I was trying to understand why. The final part of the TEDxAdelaide day was drinks and nibbles at the University Hub. But before that, there was one more talk. Mine. As Kristin introduced me, she said it was a privilege to do so, and her excitement and anticipation of this story to end the day was both challenge and reassurance that this place on stage, this moment, was for me. It was both honour and responsibility, but I also took confidence from knowing that this is what I do; I gather people, I tell stories, I send us out again. I had been nervous in the days leading up to this event, but after Friday's visit to Bonython hall to rehearse, meet Kristin and some of the other speakers, I settled into sheer excitement and anticipation of my own for what was shaping up to be - and indeed was - a fabulous day of stories and ideas shared in a generosity of spirit. 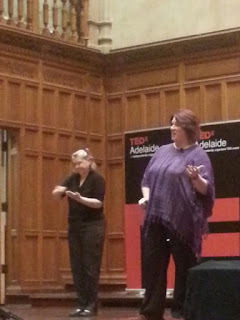 And something special did happen at TEDxAdelaide – or many somethings special. I still don't think I've quite processed the day, the ideas, the meaning that will unfold in my living from this moment on. Perhaps I will recap a few of my many tweets from the day - one way of keeping a record whilst also involving others in the day who couldn't be there but would like to have been. 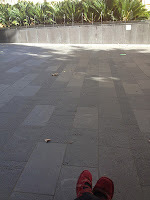 Once we had registered for TEDxAdelaide, participants were invited to sign up for one or more walks through the city. On a day whose theme was 'Explore', the invitation was to explore the spaces in our city. Options included tours of the tunnels and Haigh's chocolate factory, among other things. I chose a tour of the Migration Museum, as I've never been there before, and it seemed to me there might be some stories to discover there. This was scheduled for late in the morning, so first, I downloaded the stereopublic app to my phone and explored the city for some quiet spaces.